Remember when I wrote a primer for indie and self-published authors looking to make their debuts on Instagram? Well, I’m back this week with a new primer geared towards those of a visual bent. But instead of looking at one of the Big Five (Facebook, Twitter, Tumblr, Pinterest, and Instagram), I’m going to take a quick gander at one of the less talked-about tools in the indie author’s toolbox: Flickr! There are, of course, several key differences between Instagram and Flickr. If you’ll remember, the top 5 “best practices” I recommended for Instagram users were to (1) “Go for the gut;” (2) “Think regular, but not too regular;” (3) “You’re in the inspiration business, so share yours;” (4) “Use the hashtags and @username functions;” and last but not least, (5) “Don’t posture.” While intuition, inspiration, reliability, authenticity, and metadata remain important when you make the leap to Flickr, the platform is so different that their manifestations must also be. In fact, I’d suggest we rethink what makes a Flickr image “social” altogether. While it certainly is a place to store photos, Flickr isn’t just a high school locker we pack full to overflowing. Other visually-oriented social media websites like Instagram or Pinterest “capture” their users by making it easy to interact with photos and share items within the platform itself, and while you can certainly share links to Instagram and Pinterest content, the format of said sharing creates a hit-or-miss prospect when it comes to non-users viewing your material. That is, someone may choose to follow a link … or they may not. You may also end up with duplicates of all of your pictures if you have Instagram set to upload photos directly to dedicated Facebook albums. Not ideal, right? A lot of people think Flickr is just another cloud storage option, like Dropbox, only complicated by the fact that you can also comment on and interact with the photos on Flickr itself. Is it trying to be a social media platform, or cloud storage, or what? When you approach Flickr with the expectation that it will look and feel and function like either Pinterest or Google’s outmoded Picasa Web Album system, you’re bound to get bogged down in a messy and unintuitive tangle of groups and discussion boards and so on. It’s so much better just to skip all of that chaos and focus on what Flickr does really well, and what it can specifically do for you, an indie or self-published author. 1. Embed, embed, embed. One of Flickr’s absolute best features is its embedability. What do I mean by this? I mean you can copy either a hyperlink for an individual photograph, or a hyperlink for an entire slideshow, and integrate this code into your blog or website to display continually there. Why is this useful? First off, you can create either one-off blog posts which feature beautiful high-resolution images (a Flickr specialty)––as The Daily Beast’s Nicole Villeneuve has done in her “Moveable Feast” article––or you can create a slideshow as a permanent feature of your website, as the University of Michigan’s School of Public Health demonstrates here. 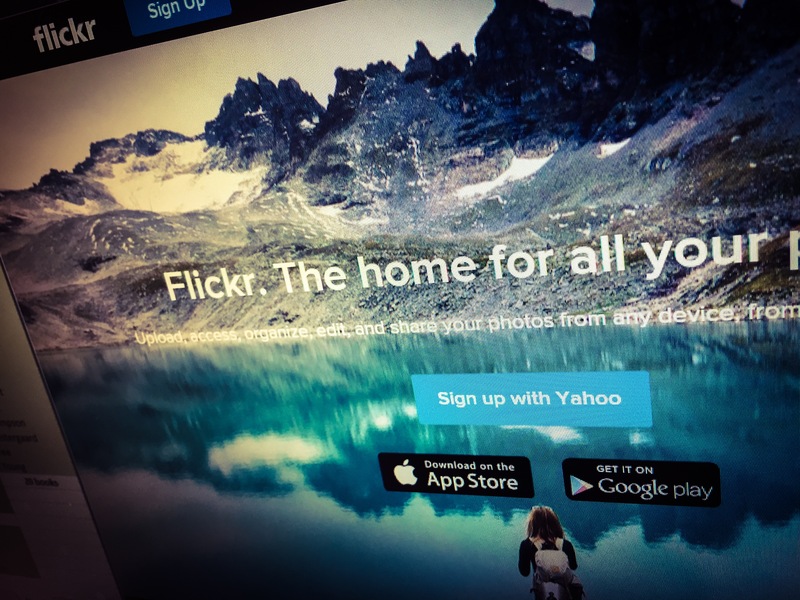 While other social media platforms may enable you to interact with your friends’ photographs within the contained environment of their networks, Flickr fills in the gaps by breaking your images out into any web forum imaginable. 2. Ramp up the quality. Instagram’s strength is that it relies upon timeliness, and a certain “in the moment” quality that brings immediacy and spontaneity to the table. Flickr, on the other hand, allows its users to upload truly high-quality photographs with minimal compression and data loss (comparatively, at least). Other social media platforms capitalize on users’ general satisfaction in simply sharing an image, no matter what quality that image is, quickly and easily. But Facebook compresses all images by as much as 80 percent, which results in a great deal of fuzz and blur. Flickr displays images at full resolution, making for giant and gorgeous incarnations of your photos in well-curated, smoothly synced pages. It isn’t just a place where “hip” amateurs upload happy snaps; it’s a digital home for serious photographers. Take advantage of both Flickr’s 1 terabyte of free storage and its cachet! 3. Think like a designer. Perhaps this one’s a little … unconventional, but Elite Truong recently wrote a lovely article for Poynter that provides a lot of great pointers on how authors can learn a little from their more visually-inclined fellow artists––and I’m feeling inspired. Think of Flickr as a medium, just as you do the white page of your word processor (or the physical paper of your notebook!). How can you build narratives with images that reflect or complement the narrative you’ve already shaped into a book? You don’t have to become a watercolorist or a professional photographer overnight––but, but––you can definitely steal a hand from their playbook when it comes to connecting with new audiences or better connecting with existing ones. 4. Cross-link your description fields. As with any other website, Flickr is rich in possibility when it comes to metadata. You can tag and even geotag your images, add titles and descriptions, and direct viewers to click on hyperlinks that lead back to your personal website. You can create thematic sets, albums, and slideshows; each new collection that you curate generates its own wave of metadata, which renders you more findable. There’s so much metadata on Flickr, in fact, that sometimes it can be a struggle to decide just where to begin. The description field? Definitely. The title? Oh, yes. You can even tweak some of the camera settings (like aperture and focal length) that are displayed alongside your images. 5. Think “Portfolio” rather than “Scrapbook.” This is not to say that scrapbooks aren’t awesome. They are. They simply aren’t a one-size-fits-all tool for every situation. Sometimes, you need a beautifully-built, professionally-presented, visually stunning home for your images. And whether you, as an author, are posting behind-the-scenes pictures of your writing space, or perhaps high-resolution illustrations of certain pages of your upcoming children’s book, or even art prints of certain favorite quotes from your works, there’s no better way to get new readers to do a double take than with a Flickr slideshow. A handy rule of thumb might be: If a picture is something you simply want to share, then Instagram or Facebook may be well and good; if it’s something you want to sell, then Flickr will showcase your product to maximum visual impact. Let’s face it, Flickr as a whole is an overlooked feature. Sure, it may be making a bit of a comeback since its makeover at the hands of former Yahoo! executive Marissa Mayer, but it’s still not the first social media platform that authors think of when they’re looking to branch out into something new. And as I mentioned before, there are some ways in which it converses easily with other platforms––there are groups, discussion boards, metadata fields, and profile pages to fill out––and ways in which it stands out. When push comes to shove, Flickr is not a substitute for any of the Big Five, simply because its many users don’t quite amount to the critical mass of millions or even billions that the upper crust of social media websites has locked in. Its specialized tools are, however, an asset and a credit to a much-needed niche if you happen to be looking for something a little … glossier … than Instagram.